For Connected Educator Month, October 16 2014, I was invited by Core Education Ltd, New Zealand to be a lead panelist. The theme Student Agency, was one of the global themes for this month. I was delighted to hear how Linda and Tim (at the elementary and high school levels respectively) are nurturing student independence of thinking and learning and fostering skills that will support them in future local and global collaborations. You can find more webinar recordings on the NZ VLN portal. 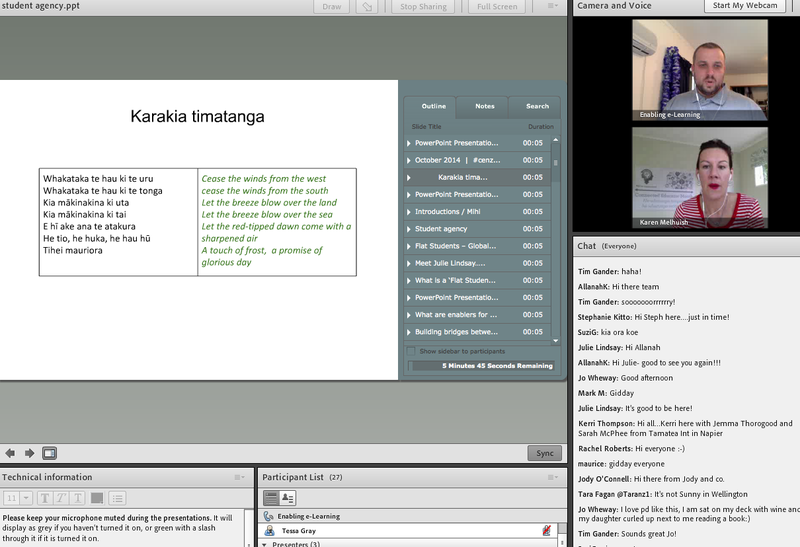 Screenshot of the opening to the webinar with hosts Nathaniel Louwrens and Karen Melhuish Spencer sharing a Maori greeting. I assume this is a common or standard way they do their webinars. Enhanced cultural awareness from the start! My slides - Flat Students - Global Learning shared ideas for student taking control of their own learning, finding their own PLNs and PLCs and engaging in collaborations that are meaningful and authentic, locally and more importantly on a global scale. I also did a soft launch of my Google Teacher Academy 'moonshot' (from 3 weeks ago). 'Learning Collaboratives' - still in the 'empathy' and 'define' stages, but I am looking to run a pilot starting February 2015. Stay connected to this vibrant and dynamic and dedicated educators in New Zealand for the remainder of October - and beyond! Lots happening over there that we should sit up and take notice of.